Today we have another installment of our new regular feature, ”Simple, yet elegant pleasures.” As mentioned in the last “Simple” post, when it comes to living with style and class, one doesn’t have to spend a lot of money. In fact, some of the simplest, most elegant pleasures in life are inexpensive or free. 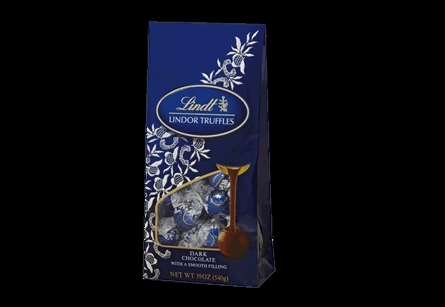 Lindt Lindor Truffles: ($15 for a 19 ounce bag and worth every penny) These delicious Swiss truffles feature a hard chocolate shell with a creamy chocolate center that literally melts in your mouth. They are so rich, you’ll likely only ever want one at a time, so the bag will last and last. Godiva: One can of course never go wrong with Godiva, which is Belgian chocolate. The Dark Chocolate Lovers Tasting Set (below) is $20 regular price (on sale as of the date of this post for $15), but you can grab a single bar at most grocery stores, as well as book sellers, gift shops and on and on. 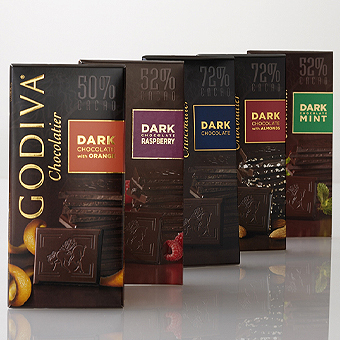 We like to buy a big bar, wrap it up and give it as a hostess gift to other chocolate lovers. Dove: This unassuming American chocolate (yes, sometimes America gets chocolate right). We love the Promises chocolate squares, because they are small, but decadent and each individually wrapped piece has a little message on the inside of the wrapper. Grab and go bags and bars are fabulous and convenient, but to kick your chocolate experience up a notch (Bam! Emeril would be proud), visit your local chocolatier. The sights, the aromas and meeting your chocolate maker are all part of the fun. 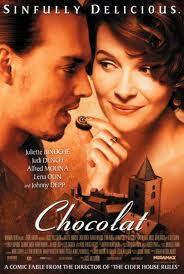 Once you have chocolate in hand, we recommend you rent “Chocolat” and enjoy a little eye candy with your candy (we heart Johnny Depp and not just because he’s from our home state of Kentucky).